Your compensation can be as little or as big as you make it. You choose the client that you want to service. Some choose their client for the compensation rate only. 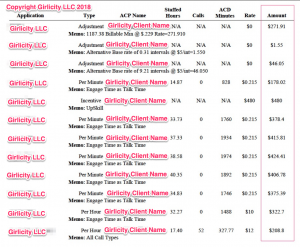 Some choose a client because they are open 24/7 and some choose a client that is super easy with less hourly pay. You set your own schedule and choose when and how much you work. Your paycheck is up to you! We have team members making between $200 – $1200 bi-weekly!